This is an American recipe so you will need to use cups. If however you don’t have any you can use a conversion website such as this one from Delia Online. 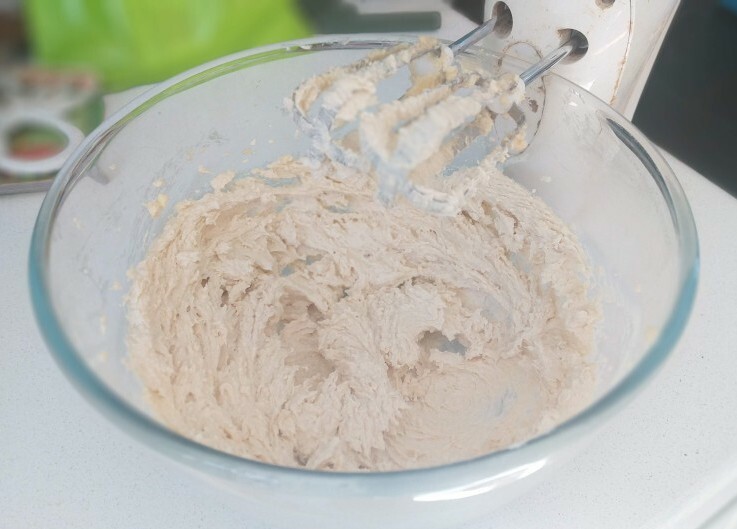 The shortbread dough needs a couple of hours to firm up so remember to allow for this if you’re making them for a particular time or occasion. You can find the recipe several places online however I used this version from the Bon Appetit website. 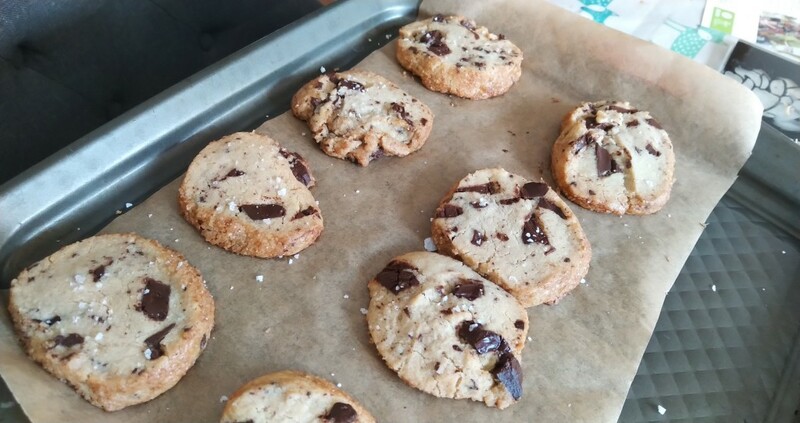 I made about 14 medium-sized cookies with a couple of small ones from the end offcuts. If you don’t have any salted butter you can use unsalted butter and add 3/4 teaspoon of salt. If you want to get ahead the dough can be made up to 1 week ahead and kept in the fridge or alternatively frozen for 1 month. 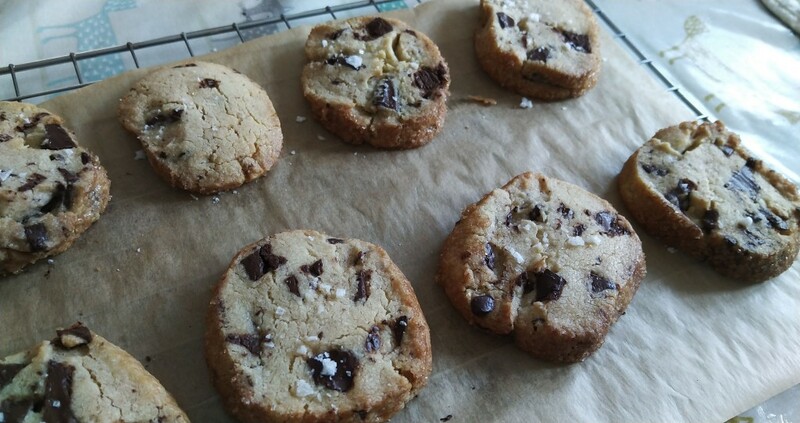 The baked cookies (should there be any left!) can be kept for up to 5 days in an airtight container. 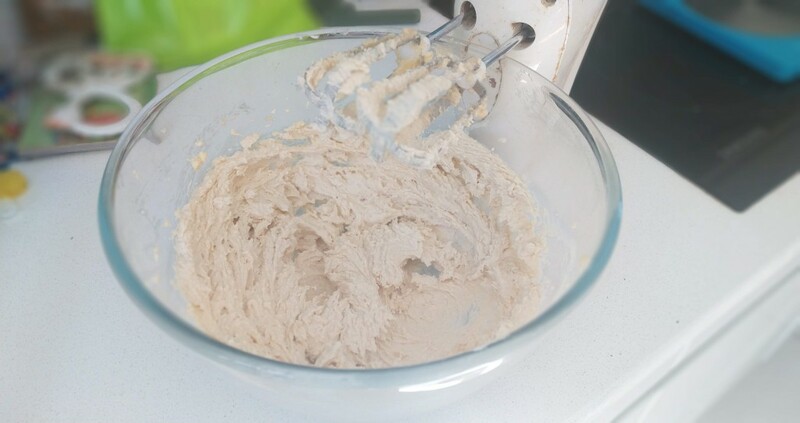 1) Using an electric mixer and a medium bowl or a stand mixer fitted with the paddle attachment, beat the butter, granulated sugar, brown sugar and vanilla extract on a medium-high speed until light and fluffy. This will take 3–5 minutes. 2) Using a spatula, scrape down the sides of the bowl. With the mixer on low speed, slowly add the flour, followed by the chocolate chunks and beat just to blend. 3) Divide the dough in half, then place each half on a large piece of cling film. 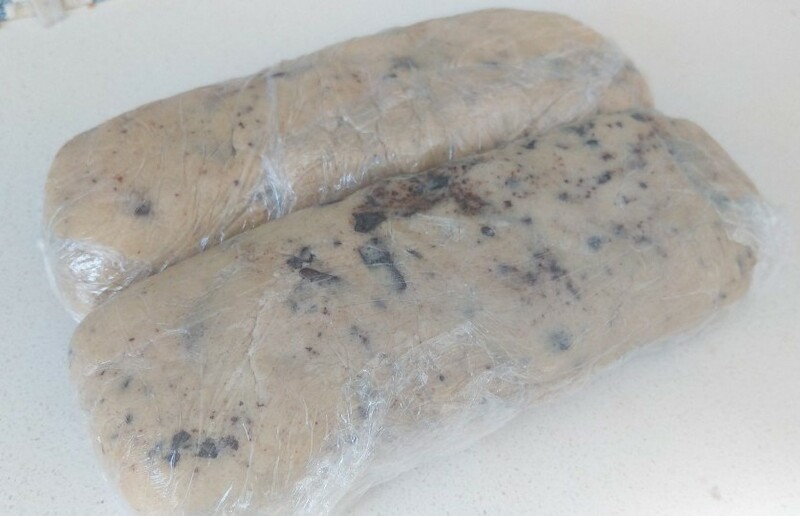 Fold the cling film over to cover the dough and protect your hands from getting all sticky. Using your hands (just like you’re playing with clay), form the dough into a log shape; rolling it on the counter will help you smooth it out, but don’t worry about getting it totally perfectly round. Each half should form logs that are 2–2¼ inches in diameter. Chill until firm (this will take about 2 hours). 4) Preheat your oven to 180°C/350°F. Line 2 rimmed baking sheets with parchment paper. 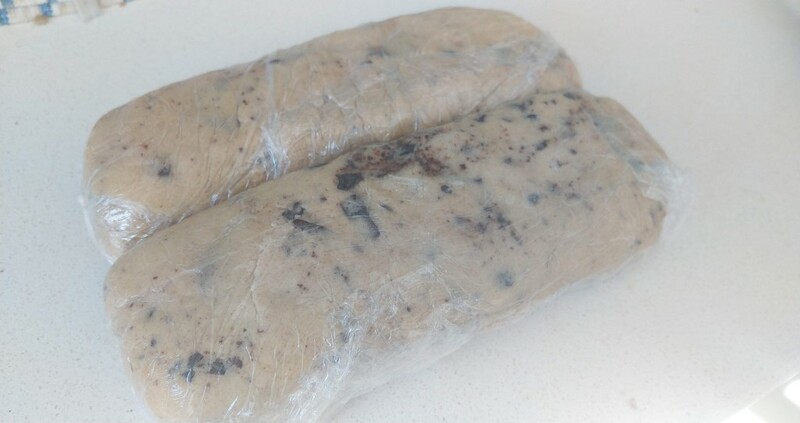 Remove the dough from the cling film and brush the outside of logs with egg wash. Roll the logs in demerara sugar (this is to give a crispy edge). 5) Slice each log into ½ inch thick rounds. 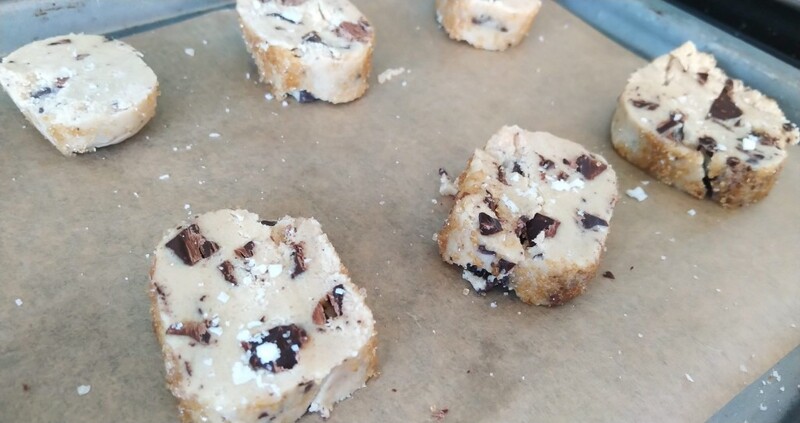 Arrange on your prepared baking sheet about 1 inch apart (they won’t spread much). Sprinkle with sea salt. 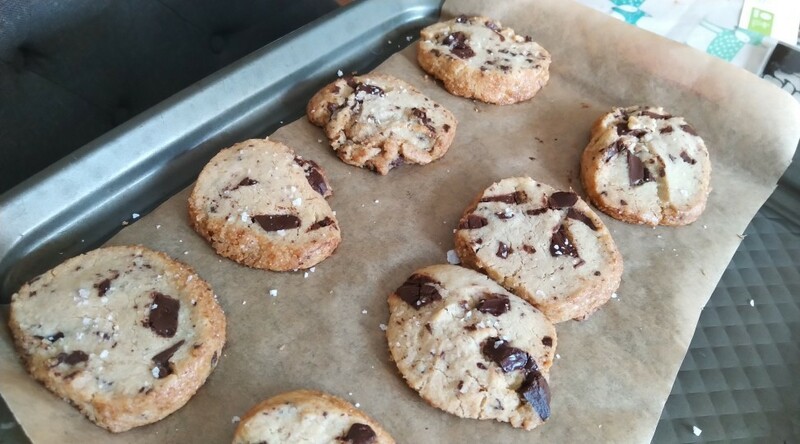 Bake the cookies until the edges are just beginning to brown, about 12–15 minutes. Allow them to cool slightly before eating.